The Ministry of Electricity announced the opening of the first laboratory in Iraq to build solar plants and the entry of 100 kilowatts of renewable energies. 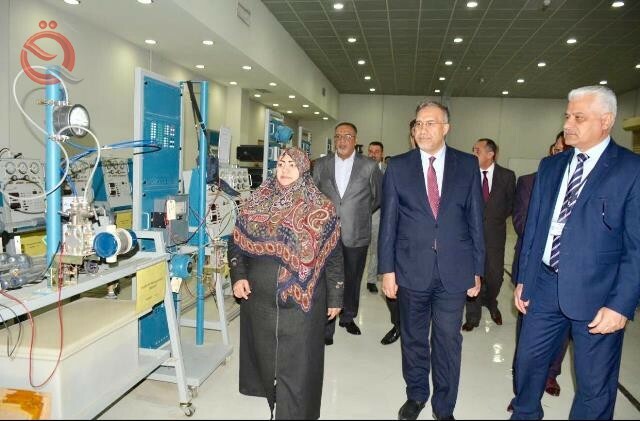 The ministry said in a statement received by "Economy News" a copy of it, "The Minister of Electricity Luay Khatib opened the first Iraqi laboratory specialized for the construction of solar plants, on Thursday, 31/1/2019, in the Department of Training and Energy Research, one of the formations of the Ministry, (100) kW, equivalent to (450) Amp, erected on the roof of Baghdad Training Center building, within the said department, and implemented by the company Al-Zawra General of the Ministry of Industry and Minerals, and synchronized with the national network, that is, it will be granted Energy to the network in the event of excess thereof and in the days of collection and holidays Official. " "I am pleased and honored to be among you today to share with you the opening of the solar power station in the Training and Development Department, which was carried out by Iraqi hands and with advanced technology," the ministry quoted the minister as saying. "This is the first step towards producing renewable and environmentally friendly energy. For the national electricity system, on the other hand, by linking them simultaneously with the national network. " "This project is a culmination of the important steps we have taken to take advantage of the enormous potential of renewable energies, which included preparing investors to establish large investment stations throughout the country's governorates, as well as awareness programs for government institutions and citizens to set up different solar systems, And provide them with the amounts spent on electric power, in addition to attribution to the electricity system. Al Khatib stressed the "training and capacity building for all employees of the ministry for all their specialties, to increase their efficiency and performance."